“It has been four years since Via Music released Åsne Valland Nordli’s album “Himmelske balsam og sødeste drue” including hymns written by the cottager Daniel Buli at “the alter of need”. The music reviewers were excited. Monday the 17th of october, Åsne left for Oslo to meet her father’s wish to record a new christmas album. The same night she met Kristin Skaare for the first time at one of the capital’s pubs. The day after, the sound manager Audun Strype and producer Sigbjørn Tveite were ready with the recording equipment and a Steinway grand piano in the Sofienberg church. They managed to do “first takes” of two songs and before the evening six more were done. The next day the last two were recorded. Åsne has a natural talent, and she started early in her youth singing folk back home in Nordheimsund in the Hardanger region. At the age of 15, she started teaching at the Ole Bull academy in Voss. Then all of a sudden, Åsne decided to lay down the music for a while, and went off to Romania where she worked among teenage prostitutes and street kids. However, now she is back in Norway, celebrating the birth of Christ in a musical way nine years after she released the treasure “Julekvad”. This time she is accompanied by Kristin Skaare (piano) who is also an excellent communicator of the heart. “Lovely holy night! Brilliant in its simplicity and authenticity. A complete and great production. “Lille Messias” is a beautiful album, yet it does not put us to sleep by the manger. “Some Christmas albums are made to create a cozy atmosphere, while others seek for the inner mystery of the Christmas gospel, and “Lille Messias” belongs in this category. Kristin Skaare’s plays the piano in a way that reminds the listener of Erik Satie as well as Aro Pârt, and makes Åsne’s voice stand out in a clear and powerful way. “Åsne Valland Nordli does not disappoint us this time either. 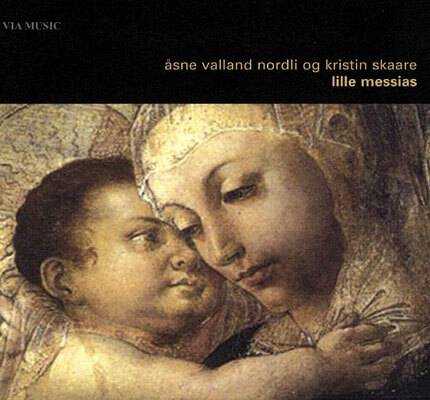 “Lille Messias” is exclusively carried away by her crystal clear voice, and Kristin Skaare’s simple piano arranging. The result is a Christmas album including a clean and transparent expression causing the listener to instantly relax. The selection of songs varies from “Det hev ei rose sprunge” to the style of Cornelius Vreesvijk. The album also includes a extraordinarily beautiful version of Erik Hillestad’s “Himlen i min famn”. It is wonderful to listen to a Christmas album that dares to let the silence come out in the music.